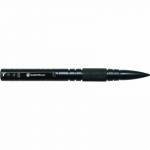 Smith & Wesson Military & Police Tactical Pen - Black. Constructed of CNC Machined Black T6061 Aircraft Aluminum. Pop Off Pen Cap with Lanyard Hole and Pocket Clip. Includes One Schmidt P900M Parker Style Black Ball Point Ink Cartridge. 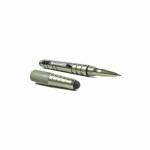 Overall Length: 6.1" Weight: 0.06 lb ..
Smith & Wesson Military & Police Tactical Pen with Stylus Tip - Silver. Constructed of CNC Machined Black T6061 Aircraft Aluminum. Stylus tip works with most touch screen devices. Includes One Schmidt P900M Parker Style Black Ball Point Ink Cartridge. 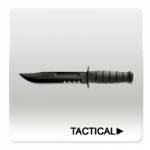 Overall Length: 5.7" Weight: 1.4 oz ..